"The kids and I enjoyed the show yesterday. Thank you for making it happen" - Brian E., Ghent NY. "Great show. Emotions were very strong, especially the in last scene" - Dan M., Hudson NY. "Creating the 3 playing areas across the stage & side area, combined with the lighting worked very well" - Dave P., Copake NY. "The show was wonderful, I am so glad I came" - Rachel W., Chatham NY. “This is the last weekend that you can see the play “Terms of Endearment” at our Grange. I was at the play last weekend and it was fantastic. The actors were superb, the lighting was professional and the flow of the play was smooth” – Bob C – Copake Falls NY.
" In movies, it is easy to go from shot to shot or scene to scene, but this does not always play well on stage. It can make a production seem choppy, or the short scenes can interrupt the pacing or “flow” of the show. Kudos to director Stephen Sanborn for taking on this challenge with expertise and skill. Scenes changes were seamless and the play moved forward with ease. "At one point in “Peter Pan,” the title character asks the audience to clap their hands if they believe in fairies .. the crowd roared with applause, saving the life of Peter’s fairy friend, Tinker Bell." (Constance) Lopez plays Peter Pan, bringing a youthful exuberance to the boy who doesn't want to grow up. The cast is filled with impressive young actors. Madison Seipp is well-mannered and inquisitive as Wendy, but she's also able to capture the excitement of flying to Neverland with John (Coltin Luckfield) and Michael (Jacob Corcoran). The Lost Children are wonderful. Meagan Corcoran and Jayden Kipp are adorable as Twin 1 & Twin 2, and Hunter Anderson leads the charge as Slightly, the oldest memver of the group. The Indiand led by Tiger Lily (Emma Hvizdak) have some of the best dance numbers. The pirates provide hilarious comedic relief, especially the impressive Chris Bailey as the overdramatic Captain Hook and Frank Leavitt as Smee. Did I mention that the members of the cast actually fly? "Great show! This is a difficult show due to the challenging technical aspects. It was very well done! " -- Dan M. from Hudson NY. "This 'Peter Pan' gives fantasy a good name. " The company ... come across a "real" children, "real" stage-Indians with an appealing "real" boy, Peter. -- Marion Hunter, The Columbia Paper. "the actors and musicians did a great job with YOUNG FRANKENSTEIN ... the (your) productions are fantastic .. keep up the good work" -- Allen H.
"It (next to normal) was absolutely awesome ..... each of the cast members was better than the last and the music was great! .... You all have great talent, enjoyed the scenery and everything about the show " -- Margaret C-F.
"Thank you for another great performance. What a show!! .... I saw the show a second time because it was a powerful show told by powerful singers singing powerful songs" -- Diane B-Y, Philmont NY.
" You do an AMAZING job! ... saw the show last weekend & agreed that this was a VERY well done play"-- Melissa S.
" BRAVO! it (next to normal)was an excellent production ... pacing was good, the orchestra and singers were well balanced, scenery and lighting worked well. 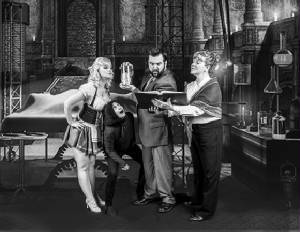 The demands on each cast member were daunting and they did an excellent job!" -- Dan M., Hudson, NY.
" Such wonderful moments, building up to a gloriously complete evening. Great work. So many small nuanced touches I never experienced in the Broadway production." -- Dennis H., Columbia County, NY. "This show was an amazingly tight performance, with the cast, the orchestra, the lighting and the set all working together for a very powerful production ... a great job handling very difficult material" -- Alissa W.m Hudson NY & Diane B-Y., Philmont NY. We are especially pleased that this is recognizing the strong ensemble performances of our cast, and the tightly orchestrated performance of the cast, orchestra & technical team. 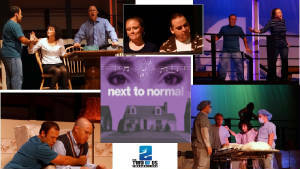 You can see all the awards by clicking here and looking for NEXT TO NORMAL by The Two Of Us Productions. I just saw your excellent production of NEXT TO NORMAL and loved it ... great job !!! Hope more people hear about it! Please put me on your mailing list for future productions! The show was fantastic. It's always good to see a piece you have never seen before, but also it was done with skill and flair. I don't think there was a moment in the show that felt wrong. Congratulations on a job done VERY well! What a devastating story! Wow. What really wonderful voices and musical direction. Great tech too...what sophisticated lighting .....My congratulations for doing such a difficult show with humanity, grace and talent. What an amazing performance of Next to Normal at the Two of Us Productions! Everyone was truly fabulous. Great job on the show! I was very caught up and engrossed in the whole thing! If you haven't seen Next to Normal yet, you have 2 chances left. 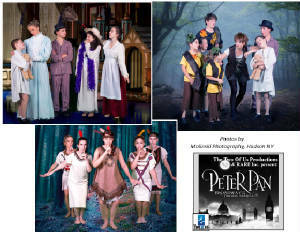 Saturday at 8:00 pm and sunday at 3:00 pm. It's a great show. Connie is TERRIFIC in it - a very demanding role. W< SPAN>ent with my friends David and Barry to see Next to Normal last night. What a terrific show! We were marveling that with a show that’s almost all singing from start to finish, we didn’t hear one bad note. As usual, great casting, great set, great music, and great directing! < SPAN>The show was a great accomplishment; so enjoyable, well done, and a great gift to the community. .... the music was just terrific and the whole production flowed so effortlessly - no easy thing with this with such material to begin with, but with such a young cast as well... A job very well done. .... To enjoy something so much, in a way that allows you to be creative AND to tell great stories to the community, is very inspiring. < SPAN>The reviews are in and the critics wholeheartedly agree this was a terrific production of NEXT TO NORMAL! "The historical period is vivid. (Evelyn) Nesbit is nicely played by a saucy Tara K. Young, Louise Pillai is a slim and rousing Emma Goldman." There are a number of attractive voices in this cast ...especially .. Paul Carter as Coalhouse Walker and Constance Lopez as Mother"
"... Carter emphasizing Coalhouse'swarmth, conflict and rage"
"Awesome! Awesome! Awesome! This word does not even do justice to the performance of LES MIS last night by The Two Of Us Productions at Taconic Hills Performing Arts Center! It was as good, or better, than any other production of LES MIS that I have seen! ... Outstanding performance!" -- Kathleen K.
"Great job with the show! I caught the first Sunday and the second Friday" -- Alan L.
"Your orchestra is very good. It is really telling when the orchestra blends in so well you hardly notice its' there, until the cymbals crash" -- Joe S.
"Masterful pit, strong voices conquer Les Mis score ... you’ve gotta love the grit and gusto of The Two of Us. Producing this humungous ... musical on a limited budget with mostly non-pros ... Stephen Sanborn, director/conductor, and Constance Lopez, actor/assistant director, have not hesitated ... Although the company has other virtues, its big claim to your attention is that its musicals appear with a full, live orchestra. ... It has never been more in-tune, more responsive to the baton, sweeter or more passionate. It exhibits a healthy brass section, a creamy-toned oboe, a folksy tuba, a solid percussion section and two keyboards supplying important glue" -- Marion Hunter, The Columbia Paper.
" (Your production of LES MISREABLES) was great, it's the best yet. " -- Lindsay P. in Hudson NY. "Wonderful production. I greatly enjoyed the show. The timing and pacing were spot on. The orchestra was fantastic, and cast work was exceptional" -- Anonymous. "I was blown away by the performance. What a great job!" -- Erin L.
" What a wonderful production you guys put on!! A must see!!" -- Lisa H-M.
" We see a lot of productions in the Capital Region and you are the cream of the crop every time. That being said, your LES MISERABLES was just fantastic, the best yet!" - anonymous in Albany NY.
" 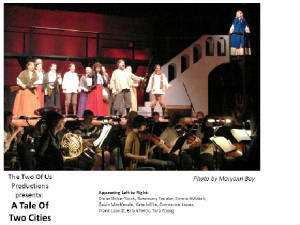 The experience of being a part of LES MISREABLES with The Two Of Us Productions was incredible. Many people I spoke with were so positive and it was an exciting adventure." -- Kristen L, Athens, NY. "On Saturday evening I went off to see RAGTIME. It is a wonderful production and made me want to read the book again I highly recommend it . "What an amazing show! Bravo!" The Two Of Us in the news! Listen to "Performance Art in Hudson" and hear a roundtable discussion from several performance groups, including The Two of Us Productions! Listen to the radio show on WGXC-Hudson archives!
" It was a great show and fabulous production, but dark and foreboding at the same time. " The Kit Kat Klub denizens looked appropriately debauched, but were clearly having a good time ...... " I enjoyed the show, although I had forgotten that it ended on such a painful and frightening note. Good Job !! " 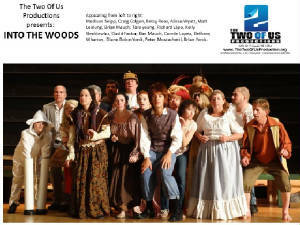 " It was great to see another quality production from The Two Of Us Productions. You seem to always manage to pull the best from your cast members and musicians! " "The Owl & The Pussycat has plenty of chemistry ... (Constance) Lopez is an exuberant actress. She makes the overbearing and crass Doris likeable and endearing." " (Harold) LaDue's Felix is stiff and stodgy, but he shows a gentle, human side to his bookworm character." " As Roxie Hart, Anahid Avsharian is at her best in her musical numbers. She dances ably, on occasion stylishly, and her songs, in terms of vocal quality, expression and dramatic phrasing, are well executed ... "
" As Velma, Roxie's mentor-turned-rival-turned vaudeville partner, (Constance) Lopez is ... a woman whose dependence on noted criminal attorney Billy Flynn ... is tempered by her weary savvy about the way of the world. Her lament with Matron "Mama" Morton (played by Katie Johnson with robust theatrical flair) is the evening's highlight. ... "
“... As was the case with Two Of Us' production of 'Man of La Mancha' last spring, 'Chicago' is in very good musical hands under (Stage and Musical Director Stephen) Sanborn's baton..."
"In this particular production, Constance Lopez plays the role in a rendering which is creative and interesting in its love/hate suggestions, Ms. Lopez is always convincing ... The always welcome, ironic and satiric 'If You Could See Her," performed with a person in a gorilla suit, drips of human sarcasm. .."
"The role of Sally Bowles, the young English lady caught in the web of the club, is well played by Cat Messing; her lithe stage action is a real plus in the production. Ms. Messing does a lovely job in the "Cabaret" song. " "Johanna Albrecht, portraying Frau Schneider, is wooed and almost won by the placid German/Jew, Herr Schultz, (played by Dave Owens), who is destined for intractable difficulty. Their duet, It Couldn't Please Me More, is downright heavenly.... "
"A really good band is at the back of the small/simple stage, and they give excellent support. " "The production is very well directed by Stephen Sanborn and Harold La Due, who martial their troupes well and convey quite slyly the electric atmosphere in this world of unreality. Choreographer Constance Lopez struts her stuff well on the stage and runway, especially in numbers like the strongly suggestive "Money" All in all, this is a well-formulated presentation." 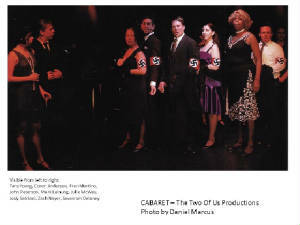 Berlin nightlife unfolds on stage in Cabaret. The days of bigotry, intolerance, religious prejudice and social upheaval are long gone. Well, it sounds good, anyway. I can think of no better words to recommend Cabaret than to quote Sally Bowles: ''What good is sitting alone in your room, come hear the music play''. You won't regret it. We were totally impressed with how much you conveyed with your well designed set & use off props. It showed how much a talented cast and director can do. I enjoyed the show immensely and I'm very glad to find such good theater in Columbia County -- Anonymous from Philmont, NY. I have heard rave reviews from my friends who attended this weekend's performances -- Dan M. from Hudson NY. Great show on Saturday night! -- Debbie B from Hudson NY. Took eleven family members, including myself, to see opening night of CHICAGO. I'd seen your previous production but I though the quality and energy of this show was by far the best! -- Ed F. from Kingston NY. "Just saw SPAMALOT! Wonderful and delightful, Bravo !!" -- Marjorie M.
"We Really enjoyed the show ... We both love Monty Python and the Holy Grail, so SPAMALOT was right up our alley!" -- Leanna & Matt O . "You guys are the best! saw it (SPAMALOT) today and was in awe of how you did such a complicated show, kudos to all involved. P.S. Loved the orchestra!" -- Carol H. from Pine Plains NY. 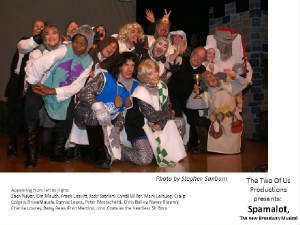 "(Your production of SPAMALOT is a) tight show, excellent cast, wonderful performance. I really like the acoustics at the Taconic Hlls PAC, I could hear every joke and every song" -- Cindy G. in Great Barrington, MA. "Great show yesterday! Enjoyed it very much." -- Neil H in Craryville NY. "Saw it (SPAMALOT) and it was absolutely hilarious and I loved it. My friend and I saw it before our vacation and often found ourselves singing the tunes throughout the entire vacation." -- Matt B. from Ancram NY. "Your orchestra is very good. It is really telling when the orchestra blends in so well you hardly notice its' there, until the cymbal crash" -- Joe S.
" You (Patsy) were great !! Good show!" -- Pete T. in Hudson NY.
" (Your productiono of Spamamot) is tight, funny, solid, a wonderful cast, it the best I've seen" -- Lindsay P. in Hudson NY. "Wonderful production. I greatly enjoyed the show. The timing and pacing were spot on. The orchestra was flawless, The acoustics in the theatre were definitely good" -- Dan M. in Hudson NY.
" We see a lot of productions in the Capital Region and you are the cream of the crop every time. SPAMALOT is the latest and possibly the best yet." - anonymous in Albany NY. "Really tight, strong cast, very funny" -- Paul M. in Great Barrington MA. "Hysterical and so much fun to watch, great songs, great orchestra, bravo!" -- Harold L. in Germantown NY. CHICAGO, The Musical - E. Fournier, Ancramdale NY.
" ..... it was amazing. Connie's song with "Momma" was magical (and very "Classy"). Too Much FUN!! I am coming back again this weekend with my Mom. Again, thanks for the hard work. It translates into a wonderful evening for your audiences ... "
CHICAGO, The Musical - M. Pezzo, Pittsfield, MA.
" The Two-of-Us-Productions' 'Chicago' was like a well-oiled machine, totally entertaining and spellbinding. Good live theater at reasonable prices -- that's what the Berkshires are about! " " ... (Constance) Lopez (as Doris W.) is a dynamo as she switches from fits of anger to loving submission, from disillusion to hope and growing self confidence. Her face beams with happiness and next grimaces with despair in a virtuoso non-stop performance." … this excellent production opts for the versatile Constance Lopez in the role originally performed by Joel Gray … From the opening Wilkommen” to the closing “Finale”, Lopez epitomizes the sordid culture of the Weimar Republic that foreshadowed the fascist takeover.… As Clifford Bradshaw, the newly arrived naïve bisexual American writer, George Lytle is both sympathetic and believable as Cliff falls reluctantly in love with the Kit Kat’s ambivalent chanteuse. That’s Sally Bowles, well-played by Cat Messing, who later sings the unforgettable invitation to the cabaret …… A second short-lived romance between Bradshaw’s widowed landlady, Fraulein Schneider and Herr Schultz, an elderly Jewish fruit merchant, gives Johanna Albrecht and David Owens an opportunity to sing a couple of bittersweet duets and solos … …. Perter Mostachetti has the right accent and bearing for the role of Ernst Ludwig, the affable Nazi … Alice Tunison is funny as Fraulein Kost, the durable prostitute whose income increases when the fleet’s in … Joseph Neuhoff, Harold LaDue, and Dan Maughan capably assume multiple roles as waiters, sailors, chorus boys and fascist goons … Trevor Tunison appears as the uniformed Tenor Soloist who sings the not so innocent anthem “Tomorrow Belongs To Me”. MAN OF LA MANCHA: Jeff Borak Berkshire Eagle - " ....in the powerful "Aldonza," a thoroughly disillusioned Aldonza (Constance Lopez), a slatternly tavern wench, hurls Quixote's idealism back in his face. Aldonza dredges up the dirt and grim realities that are and have been her life in a fierce attempt to make Quixote see her for who and what she is ....... Lopez taps a core of wrenching, anguished truth as her Aldonza, cruelly betrayed by Quixote's idealism, vents the weakness within her -- the pure and virtuous woman denied her by her birthright that has allowed her to so desperately buy into Quixote's vision of her. 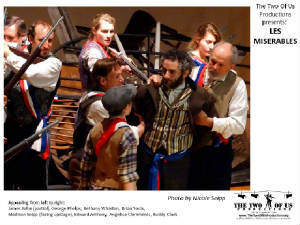 The effect is shattering"
MAN OF LA MANCHA - Edward F., Catskill New York " Thank you for an absolutely wonderful evening! .... The show itself is just wonderful. I brought my 12 year old niece. She sat on the edge of her seat throughout the show, totally captivated. Thanks again!!! " " ... everything was wonderful, from the space, the costumes, the set, the music, the choreography, and the cast and crew. ... Bravo, and here's to many more successes to come."